Lock in a great price for Holiday Inn Resort Phuket – rated 8.8 by recent guests! The location of the property is great - walking from great restaurants , the beach. The kids pool area and kids club is also very good for children. Location. Service. Breakfast. Room and bed size and comfort. it has great location that close to the beach and restaurants The swimming pool was beautiful. The staff is quite nice. That gentleman got to know that our flight is late in the evening, he helped us to late check out. Facility in Kids swimming pools is too less. More slides is necessary. It was a good centralized location easy enough to get to other parts of the island. Location is perfect, walking distance to restaurants, malls, market and Beach! Rooms are clean and big. Value for money! The hotel is close to beach. All the shops are in walking distance. Plenty of shops to get a massage.The hotel have pools for any age. The breakfast was excellent. The hotel have 3 restaurant on their grounds if you do not want to go anywhere..
Holiday Inn Resort Phuket This rating is a reflection of how the property compares to the industry standard when it comes to price, facilities and services available. It's based on a self-evaluation by the property. Use this rating to help choose your stay! One of our top picks in Patong Beach.In the heart of Patong Beach, Holiday Inn Resort Phuket offers stylish accommodations with 24-hour room service. Facilities include 6 swimming pools, a fully equipped fitness center and 4 dining options. Holiday Inn Resort Phuket is in the middle of the shopping, restaurants and nightlife of Patong. 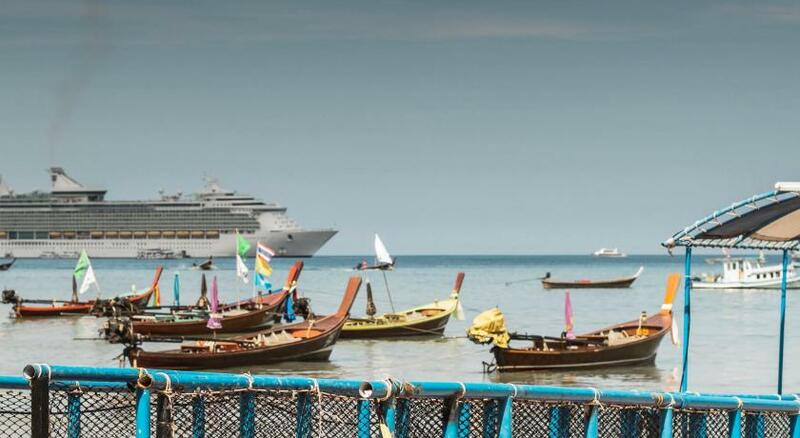 It is a 15-minute taxi ride to Phuket Town. Each modern and contemporary design room at Phuket Holiday Inn Resort features a flat-screen TV, a DVD player and private bathroom with rain shower. Guests can enjoy a relaxing massage or body treatment at the Tea Tree Spa. Other facilities include a business center, minimart and a beauty salon. Charm Thai serves Thai cuisine and Sam's offers steak specialties. A variety of Italian dishes is available at Terrazzo. For international cuisine, guests can head to The Sea Breeze Café. When would you like to stay at Holiday Inn Resort Phuket? Featuring a large glass window overlooking a pool view, this comfort studio has a 32-inch flat-screen TV, a DVD player and a work desk. A rain shower is included in a private bathroom. It also has a separate dressing area. Guests enjoy tea and coffee in this unit. This room type has no capacity for extra beds. 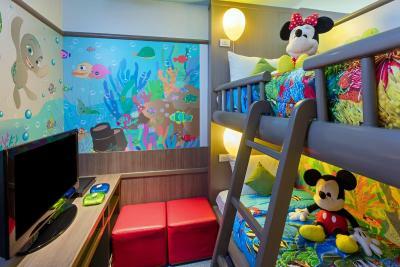 This room type can accommodate a maximum of 2 adults and 1 child under 12 years old. This air-conditioned room features a private balcony. It has a daybed, a 32-inch flat-screen satellite TV and a DVD player. Feather duvet pillow is offered. 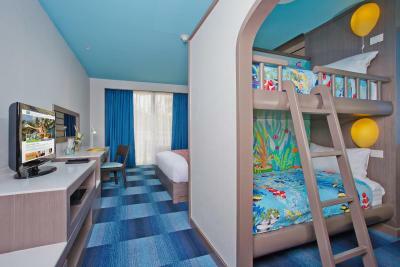 This room type can accommodate 2 adults with 2 kids age under 12 years old. It can accommodate an extra person at an additional charge. This comfort studio features a large glass window overlooking the pool view. It has a 32-inch flat-screen TV and a DVD player. A rain shower is included in a private bathroom. This unit has a separate dressing area. Tea and coffee are provided. 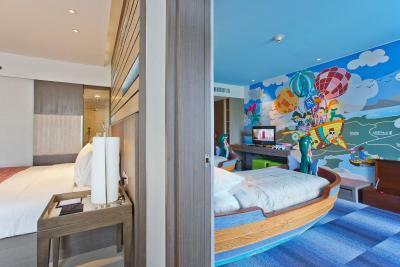 Featuring a private balcony, this air-conditioned room offers a 32-inch flat-screen satellite TV and a daybed. Please note that this room type has no capacity for extra beds, bed type and smoking preferences. Bed type preferences will be subject to availability upon arrival. 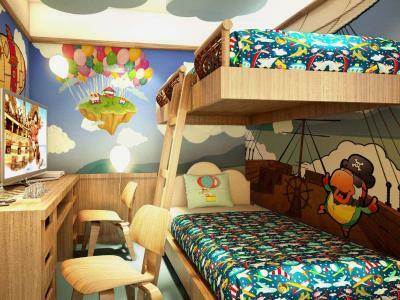 This room type can accommodate 2 adults with 2 children age under 12 years old. It can accommodate an extra person at an additional charge. Featuring a private balcony overlooking the main pool, this room includes a 42-inch flat-screen cable/satellite TV, a DVD player and a refrigerator. Guests can use a free minibar. It also has a safe and an electric kettle. A bathtub, shower and free toiletries are included in a private bathroom. This room type can accommodate a maximum of 2 adults. This air-conditioned room includes a 32-inch flat-screen cable/satellite TV, DVD player and daybed. It has a minibar, an electric kettle and a private bathroom. Feather comforter pillows are available. 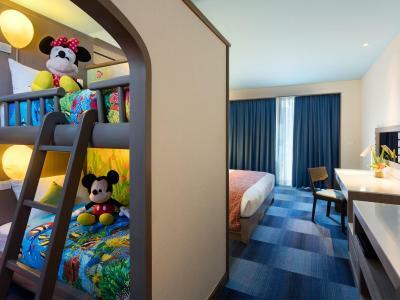 This room type can accommodate 2 adults with 2 kids under 12 years old. It can accommodate an extra person for an additional fee. The family room composed of two connected rooms - a Superior Room with a themed room for children. Children will be able to enjoy games and DVDs in the room. It comes with a bathroom, complimentary coffee/tea and drinking water. Offering direct pool access from the private balcony equipped with sun loungers, the villa is located in a adult-only area. It offers up to 50-sqm of living indoor space and comes with a mini-bar, DVD player and a iPod docking station. The adult-only villa offers much privacy with a large seating area that overlooks the pool. Offering up to 50-sqm of living space, the room comes fitted with Thai-style decor and hardwood floors. Guests will find a mini-bar, DVD player and a iPod docking station in the room. Many years of services, Holiday Inn Resort opened since 1987. From times to times, our team always looking at improving our services. Great location located in the middle of Patong very easy access to other entertainments, shops but very peaceful in hotel premises.7 room categories to suite your holidays. Holiday Inn Resort Phuket is the best choice for everyday travellers. House Rules Holiday Inn Resort Phuket takes special requests – add in the next step! Holiday Inn Resort Phuket accepts these cards and reserves the right to temporarily hold an amount prior to arrival. Please be informed that the swimming pool and sun loungers located in the Busakorn Wing is reserved for guests who are staying in this wing. Guests staying in main wing are not entitled to use these facilities. The pool area in the villas is exclusively for guests staying in the Villa with Pool View or Villa with Pool Access. Guest staying in other room categories such as studio or superior rooms are not allowed to access the villa area. The resort can arrange an airport transfer at an additional charge. Please contact the property direct for more information. Contact details can be found on the booking confirmation. Please note that in case of early departure, the property reserves the right to charge the total amount of the reservation. Please note that the name of the credit card holder must be the same as the guest's name and credit card must be presented to the property upon check-in. In the case that the credit card is not presented, a new payment will be required from the guest. The room was really spacious very clean, nice big bed, well stocked mini bar with soft drinks. Towels changed daily with an offer of more towels in the evening. Fruit delivered to room daily. Walking distance to beach and shopping centres. Facililties in the Busakorn area were great, the pools, the restaurants, the rooms, nothing to complain about. We wish we had booked more days here. Very calm and relaxing. Staff, especially reception staff is uppity. Pool closes early and opens late for a beach resort! Elevator to rooms by the restaurant inoperable after 10pm. Very nice hotel, clean,beautiful and safe located between Beach Road and Second Road. I visited this hotel a couple of times during the last years and everytime I was highly satisfied. The people are fake!! the work for the sake of working. It was the elections and alcohol was banned from 6pm 24th for 24 hours and no one including booking.com thought it was important to tell us. We were caught by surprise that we are on a holiday and had to stay sober due to no single drop of beer anywhere! due to this, Phuket or Thailand will be last on my list and I will stop using booking.com to book hotels anymore as all are eager to close deals but fail to keep information flowing. booking.com replied me with all sort of excuses less for a single ounce of apology and the hotel manager told my wife that only we complained and others did not. Very professional for an international brand. hotel is actually good and my preferred location when I am in Phuket. Price is higher then other hotels yet I chose to stay there. The staff at the property is rude - after being recommended by the hotel staff we went to the Thai restaurant for dinner at 10 PM when the last order is 1030 PM as a group with kids and older people. The staff did not greet , was so hesitant to serve us and visibly upset that guests had walked in. Staff at the main reception is also unpleasant, not helpful. The only time they were polite is after they lost our luggage - we had a transfer arranged by the hotel which upon reaching the hotel left a suitcase in the van. The hotel staff insisted that they unloaded all luggage , we had to push them to check the van where they found the suitcase. Facility appears to be aged. Despite informing the check-in time in advance the rooms were not ready and had a minor issue while check-in. The desk staff were not able to resolve it and hence required Manager interference. Location of the hotel was good and was family friendly. Massage and swimming pool facilities were good. Had a minor issue while check-in but the Manager of the hotel sorted it out well. Had a pleasant and memorable stay in the hotel and I would recommend it for family stay. We stayed in the hotel with my 4 yrs old son and wife. We liked the location, breakfast and cleaning service in the rooms.